You are here: Home / Basics / Basics: What is Binary CAM (BCAM) ? Basics: What is Binary CAM (BCAM) ? Note: You should understand what Content Addressable Memory is before reading this post. Binary CAM performs a binary lookup ands returns either a 1 or 0. The destination MAC Address is used as an index to lookup the output port. The destination MAC Address is extracted from the Ethernet header. The MAC address is already a binary format and can directly matched for every bit in the silicon. 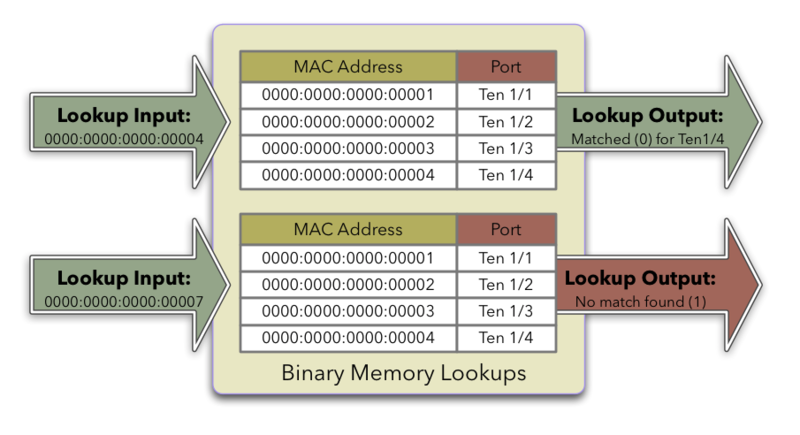 The search look ups the BCAM table of MAC Address and either finds the a complete match for the MAC address or doesn’t – a binary condition. When a match occurs, the Binary CAM will return the value of the output port and the packet will be queued for egress on that port. When there is no match, the packet would normally be flooded out of every port in the switch (using the replication engine described in the previous section). Note: You should read about Ternary CAM after this post.